Expo 100 is a celebration of one hundred years of Northern Ireland that will be held in 2021. 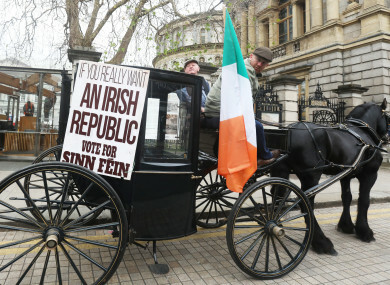 Thomas Clarke with Ronnie O’ Brien from Cabra in a replica horse and carriage outside Leinster House. THIS WEEKEND, SINN Féin is holding its party’s celebration of the 100th anniversary of the first Dáil Éireann. It’s holding its own celebration of the 1918 election, where 73 of 105 seats were won by a Sinn Féin party led by Éamon de Valera. The current Sinn Féin party took its form after an Ard Fheis in 1970, where it officially split over whether the IRA’s use of violence to end British control in Northern Ireland was acceptable. An exhibition will take place at the Mansion House from 11.30am followed by the main event at 2pm which will include an address by Sinn Féin Leader Mary Lou McDonald. Speaking to TheJournal.ie earlier this week, McDonald said that it was a “pivotal moment in Irish history” and that it was “appropriate that we remember those days”. When you read the democratic programme of the first Dáil it’s extremely relevant in terms of what we have to achieve. The Sinn Féin 1918 manifesto stated, that Sinn Féin would achieve its aims by: “withdrawing Irish representation from the British parliament, and by denying the right, and opposing the will, of the British government or any other foreign government to legislate for Ireland”. The Sinn Féin leader also commented on why her party wouldn’t be taking part in Expo 100 – the commemorations for the 100 anniversary of Northern Ireland that will be held in 2021. It led to conflict in every generation since partition and it’s something that’s not worthy of celebration. It’s one of these historic pieces of unfinished business that we need to resolve. I very much hope that it is something we will resolve in the course of our generation. The commemorations aim to celebrate Northern Ireland’s heritage and attractions, as well as promote it as a region to live in work in and to visit. Email “'Not worthy of celebration': As Sinn Féin celebrates first Dáil, it's adamant it won't take part in Expo 100”. Feedback on “'Not worthy of celebration': As Sinn Féin celebrates first Dáil, it's adamant it won't take part in Expo 100”.